1.The cookie box holds eight homemade chocolate chip cookies in a Large Cello Bag tied with a yummy Old Olive Striped Grosgrain Ribbon bow. 2. Just punch several 3/4″ circles to slip behind your Jolly Holiday Designer Paper to make a cute large scalloped border to match the polka dots. 3. The sentiment from Loads of Love fits nicely in the Large Oval, nested in the Scallop Oval, and popped up to cover the Christmas greeting from Tags til Christmas. 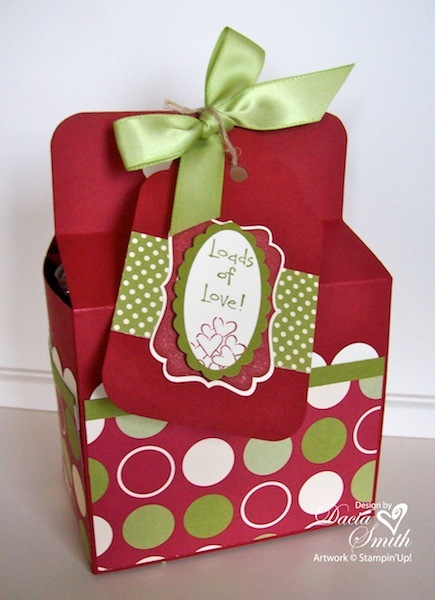 All the coordinating layers make for a WOW to adorn the cute little holiday box. Box Pattern available for download. Pattern may not be sold or posted elsewhere. Please forward links here! 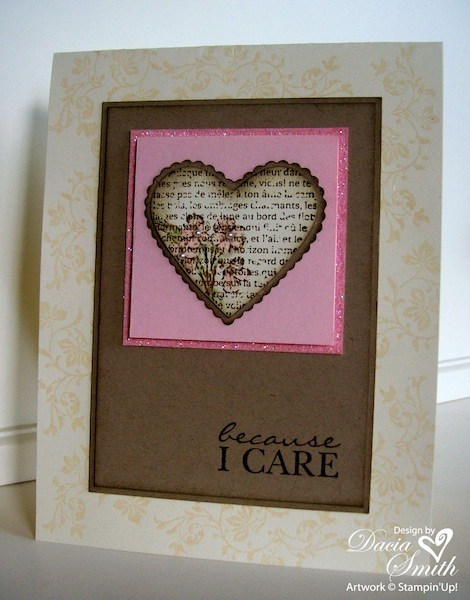 1.Try stamping your card base and adding Clear Embossing Powder for a dramatic background, and a sweet romantic touch. 2. The Dazzling Diamonds added to the edge of the Pretty in Pink layer draws special attention to the focal image. 3. The Basic Pearls for the center of each flower added just the right finishing touch. A few well placed accessories are a girl’s best friend. 1. The Christmas table favor box holds two Ghirardelli chocolate squares. A sweet treat for any special dinner party guest. 2. The ruffled border on the box is done with the Old Olive Striped Grosgrain Ribbon attached using Sticky Tape. 3. 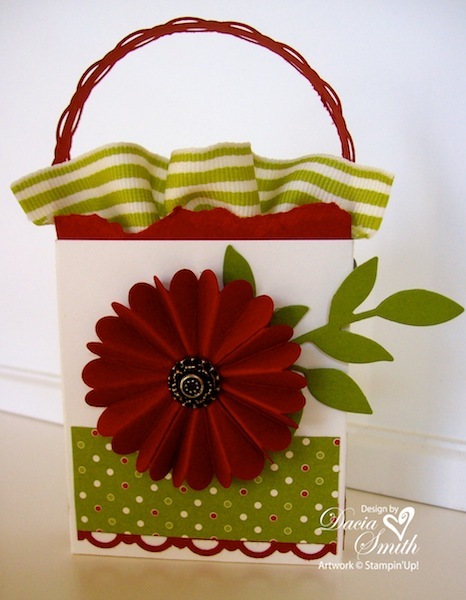 The accordion flower is created from using two scallop circles. Each circle is folded in half all the way around at each scallop. Cut one crease to the center of the circle, and accordion fold all the way around. Attach the halves together, and place an Antique Brad in the center.